In Why Have Kids?, Valenti explores these controversial questions through on-the-ground reporting, startling new research, and her own unique experiences as a mom. She moves beyond the black and white "mommy wars" over natural parenting, discipline, and work-life balance to explore a more nuanced reality: one filled with ambivalence, joy, guilt, and exhaustion. Would-be parents must navigate the decision to have children amidst a daunting combination of cultural expectations and hard facts. And new parents find themselves struggling to reconcile their elation with the often exhausting, confusing, and expensive business of child care. When researchers for a 2010 Pew study asked parents why they decided to have their first child, nearly 90 percent answered, for "the joy of having children." Yet nearly every study in the last ten years shows a marked decline in the life satisfaction of those with kids. 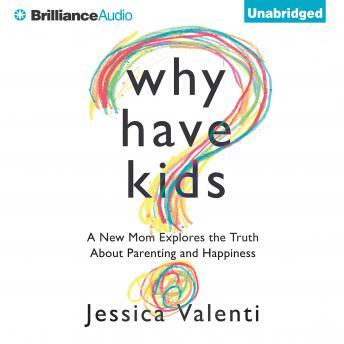 Valenti explores this disconnect between parents' hopes and the day-to-day reality of raising children-revealing all the ways mothers and fathers are quietly struggling. A must-listen for parents as well as those considering starting a family, Why Have Kids? is an explosive addition to the conversation about modern parenthood.